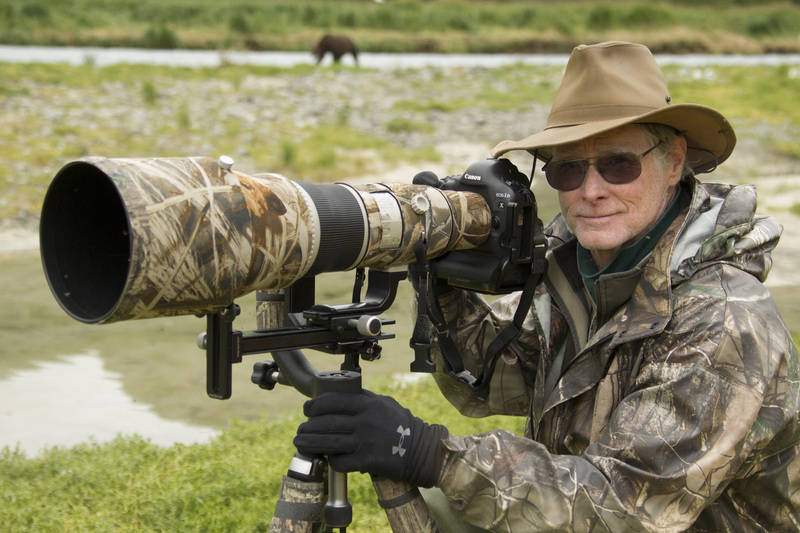 Joe McDonald on location with his gear in Katmai National Park. For the past twelve years, biannually, we’ve been leading photo tours to coastal Katmai National Park in Alaska to photograph Brown Bears. 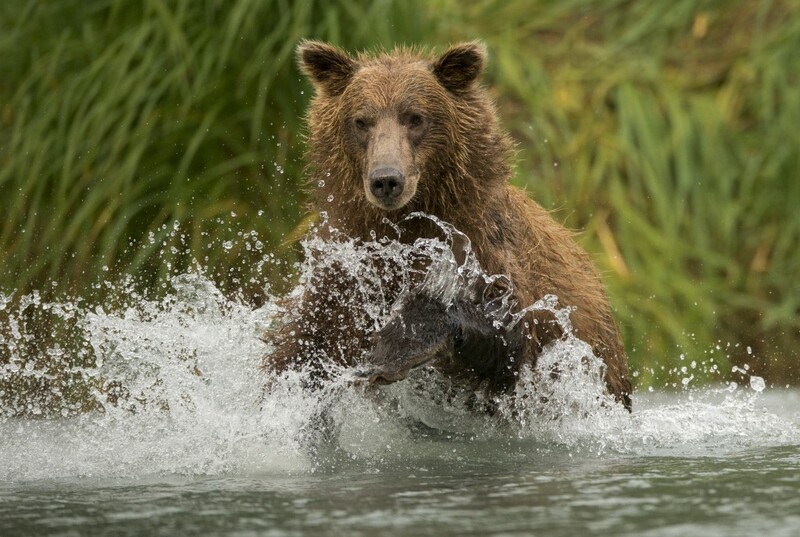 In late summer bears gather along streams to feed and fatten on salmon, providing incredible opportunities for both action shots and close-ups. Having done this at least six times previously, there is always the possibility of falling into a rut, of shooting the same thing, no matter how exciting, again and again in the same way. This year I hoped to do something different, and so I used an 800mm lens for the first time. In the past, I’ve shot with a 500mm and I felt that I had plenty of lens for the job, and I did worry my decision to use the 800 might be regretted, that I might have too much glass and be compromised in my shooting. Nevertheless, hoping for something new I took the risk anyway. I’ve always had reservations about Canon’s 800mm because it is a relatively light lens, considering its focal length. I worried that without the weight or mass of a heavy lens, wind or photographer-induced vibrations would degrade the image. Perhaps this isn’t as serious a worry these days with the high ISOs available on digital, allowing for faster shutter speeds to negate vibration or motion shake, but it was still a concern. However, I was also trying something new with the lens that I hoped would help. This year, for the first time, I used the RRS Long-Lens Support system to brace the 800mm lens. I was also using a new tripod, the TVC-34L Series 3 Versa, and the TA-3-LB-HK leveling base, onto which I mounted my Wimberley gimbal head. Honestly, with this rig in place I felt like I was shooting off the equivalent of a Ferrari or a Lexus, as opposed to my previous arrangement (a VW perhaps) where I simply had my lens mounted on the Wimberley on a tripod. The new system was incredibly sturdy and secure, and whether I had the system locked down or if I was panning, I had a solid lens mount. The 800mm lens is well supported by the Long Lens Support Package. I’ve seen many people using a Wimberley with the locking knobs positioned on the left side of the lens, but I recommend people mounting their lens so that the knobs are on the right. On the left, if a shooter wants to further brace or control the lens, or to fine-tune focusing, he/she has to reach around or over the upright section of the gimbal. Those using that method say they are now free with their right hand to lock the knobs when necessary, but I find the argument lacking. Here’s why. Mounted on the right side, I’m free to control the lens with my left without any interference, and if and when I lock the rig in a position I do so with my right hand. Although this does take my shooting finger away from the shutter button for a moment, this isn’t a problem. After all, I’m locking the knobs because my subject is static, so the brief time away from the shutter isn’t an issue. Using the Long Lens Support, I position the sliding brace toward the very front of the lens barrel, just shy of the lens hood, so that the lens actually is lifted slightly in the mount. Sometimes, in controlling my pan, I’ll rest my left hand on the rack of the Long Lens Support, which provides a very comfortable position for guiding the panning motion. The leveling base was a great addition, too, for fast shooting. Although I could certainly level the camera by rotating the lens barrel, this does not address balance or center of gravity issues. In the past, without the leveling head, adjusting for the center of gravity would require time-wasting seconds as I adjusted one or more tripod legs, either by extending, splaying, or narrowing the leg spread. With the leveling head, a quick turn of the lock re-seated my tripod head in to a more balanced position, eliminating any need to mess with the legs in fast-breaking situations. My reluctance to use an 800mm has now been eliminated, due to my confidence in having a secure lens support. Honestly, when I first saw the system I thought it was unnecessary and an accessory for gear heads, but now that I used it I have an entirely different opinion. If you use a 600mm or 800mm, I’d strongly recommend using this support. Joe McDonald is a Wildlife Photographer and Instructor with his wife Mary Ann, based in McClure, PA. Article and images Copyright © 2013 Joe McDonald. All rights reserved. Great action shots of those bears! 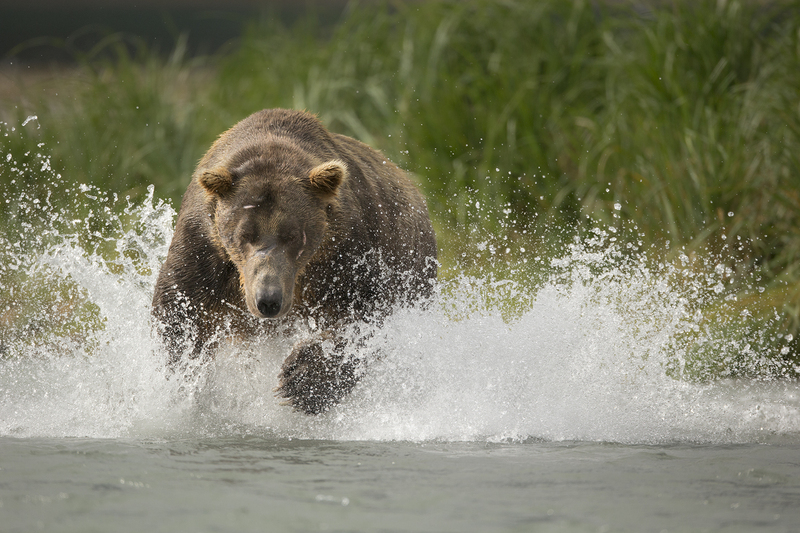 I was in Alaska photographing bears in July and agree with you about Really Right Stuff gear. I used the TVC-24 with a Wimberley gimbal. 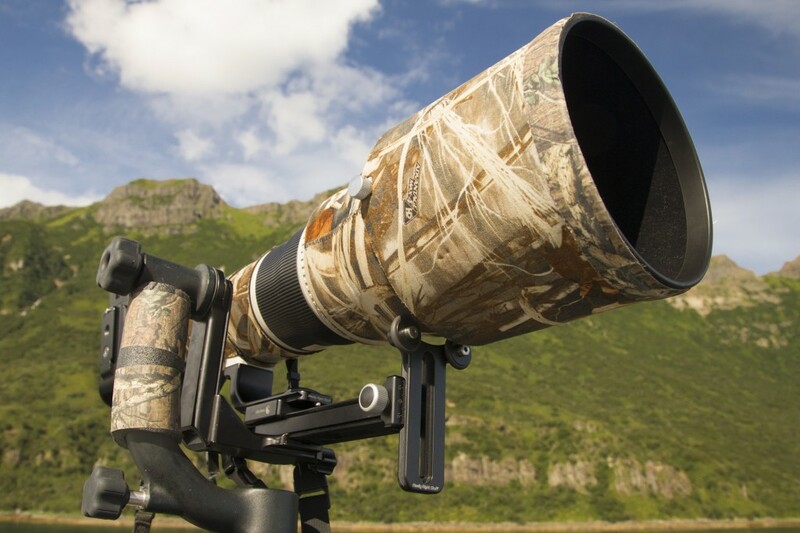 That combination supported a Canon EF 400mm f/2.8L IS II USM and Canon EF 500mm f/4L IS USM. It was solid and I never had to worry about my equipment out in the field. Plus, I used it in mud, sand and salt water with no problems. Highly recommended! 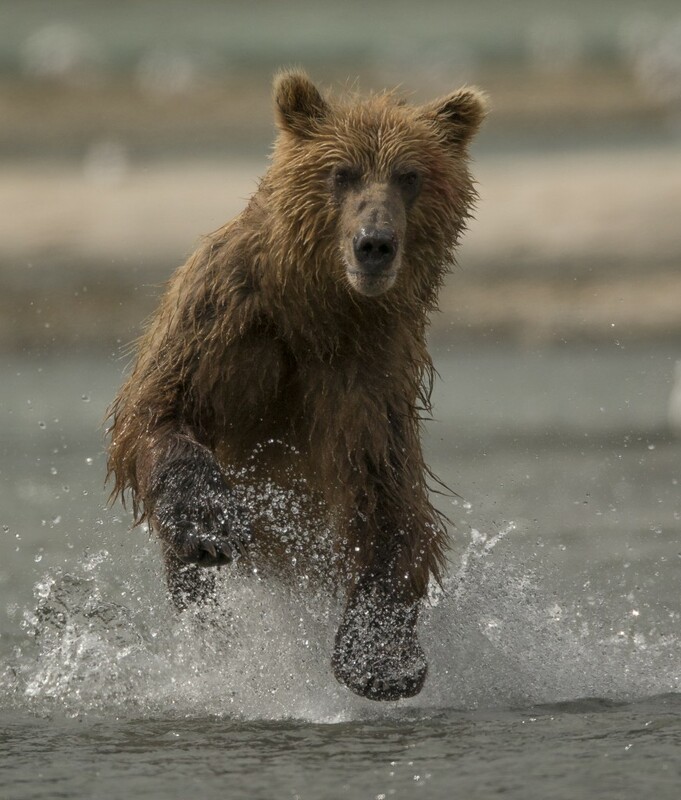 I have been on the Katmai Coast but also in the Interior of Katmai for several summers. What boat are you working with?